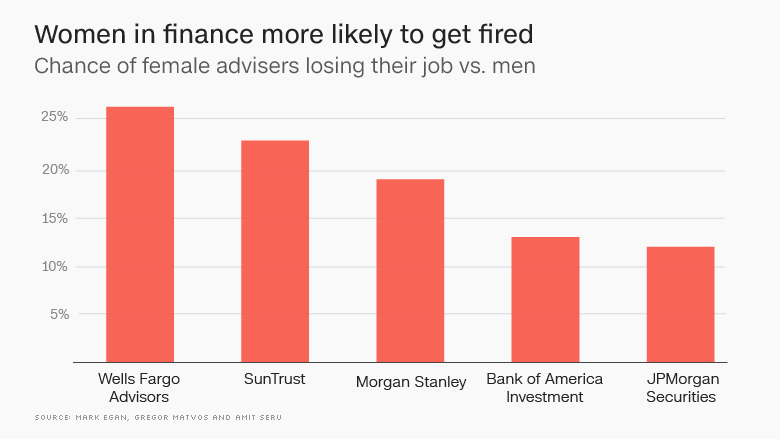 Female financial advisers get punished more severely than men, especially at Wells Fargo. 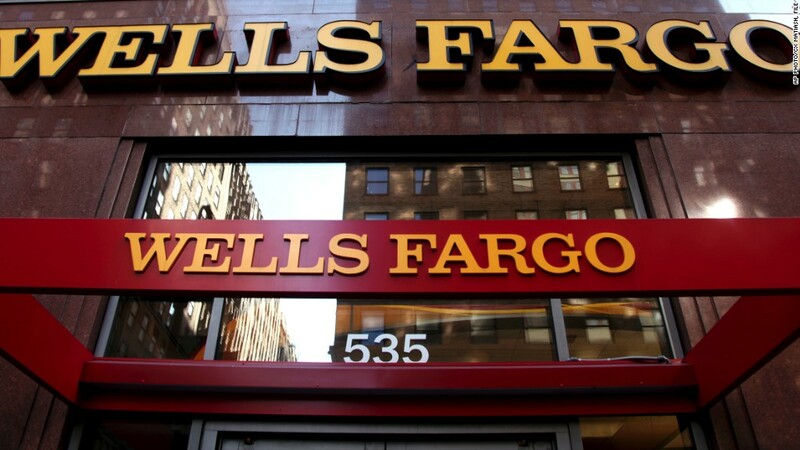 That's according to a new working paper that finds female employees who engage in misconduct at Wells Fargo Advisors are 27% more likely than their male counterparts to have lost their jobs. Wells Fargo Advisors had the highest rate of female workers leaving among the 44 firms studied between 2005 and 2015. It was followed closely by A.G. Edwards, which is also a division of Wells Fargo. The researchers connected the dots and concluded the employees were often leaving because they were fired. "The financial industry is willing to give male advisers a second chance, while female advisers are likely to be cast from the industry," wrote professors Mark Egan of the University of Minnesota, Gregor Matvos from the University of Chicago and Stanford's Amit Seru. The research was published by the National Bureau of Economic Research (NBER), a prestigious nonprofit group known for declaring when recessions begin and end. The findings are likely to add to concern about the cultural problems at Wells Fargo exposed by the bank's fake account scandal. Former Wells Fargo employees have told CNNMoney they were retaliated against after calling the bank's ethics hotline about the illegal sales activity. Wells Fargo Advisors said in a statement it's examining the study's "assumptions and conclusions carefully" and said there are "substantial questions" about the data and analysis behind it. "As always, our focus is on providing a diverse and inclusive work environment," Wells Fargo said. SunTrust Investment Services and Allstate Financial Services also ranked high, with female workers there over 20% more likely to lose their jobs than men with misconduct. Morgan Stanley (MS), Bank of America (BAC) Investment Services and JPMorgan (JPM) Securities were also in the top 10. After examining data on roughly 1.2 million registered financial advisers in the U.S., the study found that females industrywide face "harsher punishment" than men. They are 20% more likely to be fired after missteps and 30% less likely to find new jobs. That's despite the fact that researchers found that men are three times more likely to engage in misconduct and twice as likely to be repeat offenders. Men also engage in conduct that is 20% costlier, the paper found. "Our results suggest that firms, and the industry as a whole, exhibit substantial discrimination against women when doling out punishments following misconduct," the paper said. The financial advisory industry has a history of misbehavior. Roughly one in 13 licensed employees in the industry has a record of misconduct, but that drops to 1 in 33 for females, researchers said. Julie Nugent, vice president and center leader at workplace inclusion nonprofit Catalyst, blamed the findings on gender stereotypes. "Women can be judged more harshly. I call it the Goldilocks Syndrome. Women are perceived as too soft or too tough, but never just right," Nugent told CNNMoney. It's worth noting that a Wall Street lobbying group has accused the authors of using methodology that "significantly overstates" misconduct by including all licensed securities personnel. The Securities Industry and Financial Markets Association, known as SIFMA, notes that "less than half" of these employees are actually client-facing financial advisers. However, SIFMA acknowledges that the other half do still hold critical roles such as traders, investment bankers or compliance and legal employees. Morgan Stanley said in a statement that it's "committed to treating all employees fairly and equally" and has "extensive programs in place to build a diverse, inclusive network of financial advisers." Representatives from SunTrust (STI), Allstate (ALL) and Bank of America did not respond to requests from CNNMoney for comment. JPMorgan declined to comment. The paper, titled "When Harry Fired Sally," acknowledges that the gap between terminating men and women could simply be evidence of "statistical discrimination." After all, firms could be deciding to punish women more severely because they engage in more expensive bad behavior or are less costly to replace. Yet the academics found "empirical evidence suggests the exact opposite." They compared male and female advisers at the same firm, in the same location and at the same point in time. The research shows "large and pervasive differences in the treatment of male and female advisers." For instance, female advisers experience a "disproportionate share" of misconduct complaints that are filed by the firm, instead of customers or regulators. Moreover, companies with a greater percentage of male executives tend to punish women more severely and hire fewer females who have a history of misbehaving. Editor's note: A previous version of this story said women at Wells Fargo were over 25% more likely to lose their job than males. One of the authors pointed out the specific percentage is 27% and the story has been updated to reflect that.